Exuviance skin care is clinically proven to reduce lines and wrinkles, increase skin firmness, smooth skin texture and even skin tone with a patented bionic blend of highly evolved Polyhydroxy and Alpha Hydroxy acids. Discover dermatologist developed skincare that has perfected the science of skin transformation by delivering full-strength anti-aging benefits without any irritation. 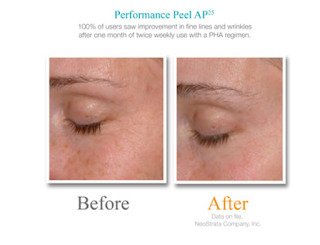 This peel contains 12 peels (a 6 week supply). It can be used up to twice a week on face, backs of hands, neck, chest and body. They are fragrance-free, dye-free and paba-free. “With regular use, the Exuviance Performance Peel AP25 is an ideal way to significantly reduce visible signs of aging, improve the texture of the skin, and create a better starting point for any in-office procedures my patients choose to pursue. It contains alpha hydroxy acids - the same peeling agents found in many office peels - but at a level with minimal recovery time. These peels are a safe and easy way for patients to exfoliate their skin and maintain a healthy-looking complexion in between office visits.” -Dr. Julie K. Karen, a board certified dermatologist currently practicing in New York. First, cleanse the face with a gentle, effective cleanser such as their Purifying Cleansing Gel. You may leave the (Step 1) Activator Solution on your skin for up to, or as long as 10 minutes, and no longer than 10 minutes. Some people may experience some bothersome dryness or stinging during the 10 minute time frame the activator solution in on their face. For those skin types they suggest applying the (Step 2) Neutralizer Solution earlier than 10 minutes, or as soon as you experience the stinging sensation if you find it bothersome. As with all Hydroxy Acid peels, a slight tingling sensation is expected, but if this sensation is too much, they recommend neutralizing the peel sooner than the total 10 minute time. Follow with a moisturizer such as Evening Restorative Complex. The box contains 12 peels (a 6 week supply), which can be used up to twice a week on face, chest and back of hands where exposure to sun and the environment can lead to the first signs of aging. An extra peel is included for testing your skin’s sensitivity. While developing new treatments for serious medical dermatology conditions, Dr. Eugene Van Scott and Dr. Ruey Yu discovered Glycolic Acid, a compound naturally found in sugar cane, with deep anti-aging benefits. Among the founding fathers and recognized leaders in the field of dermatology, they hold the first patent for Glycolic Acid and developed and patented the Glycolic Peel. 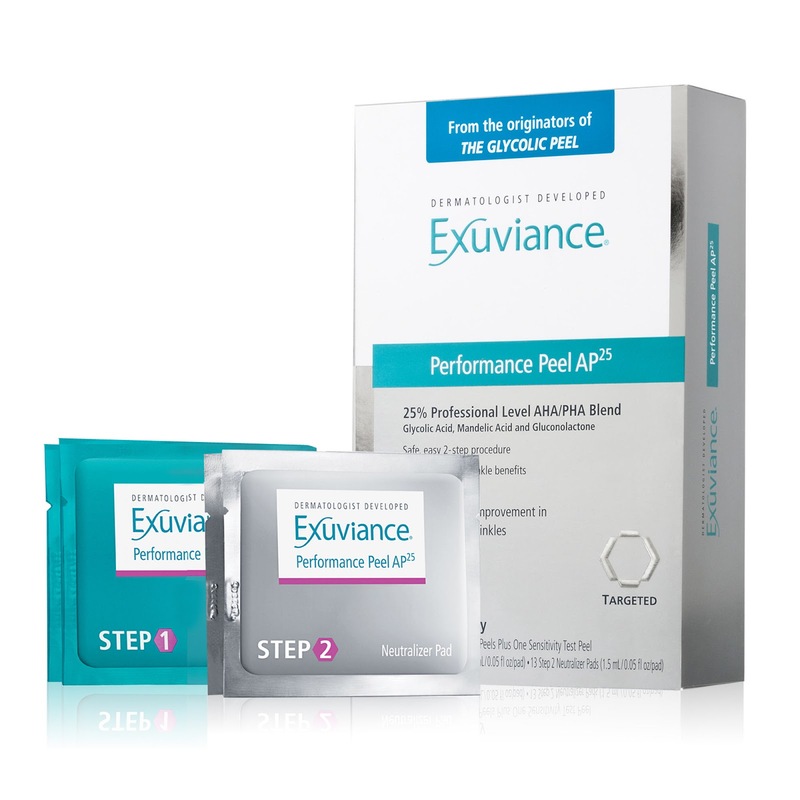 The Exuviance Performance Peel AP25 is expertly formulated with a 25% professional level of Alpha Hydroxy and Polyhydroxy Acids, including Glycolic Acid, delivering maximum anti-aging benefits with minimal irritation. Personally, I love this peel. It does a lot for the skin without any irritation to it. I found that my skin looked so much better after using this peel for a month twice a week. I noticed that my hyperpigmentation had lightened up significantly, my skin tone was much more even because of that, my skin was brighter and looked better, I had less wrinkling in between my brows (those furrows you get), even the wrinkling around my mouth was better and finally my pore size looked a lot better too lately. I really had a good experience with this peel. I would highly recommend it anyone who uses peels already and can withstand glycolic acid at least in a 10% strength. For me, I did not experience any irritation or any redness. Nothing bothersome in the least. But my skin is used to peels and AHA's. 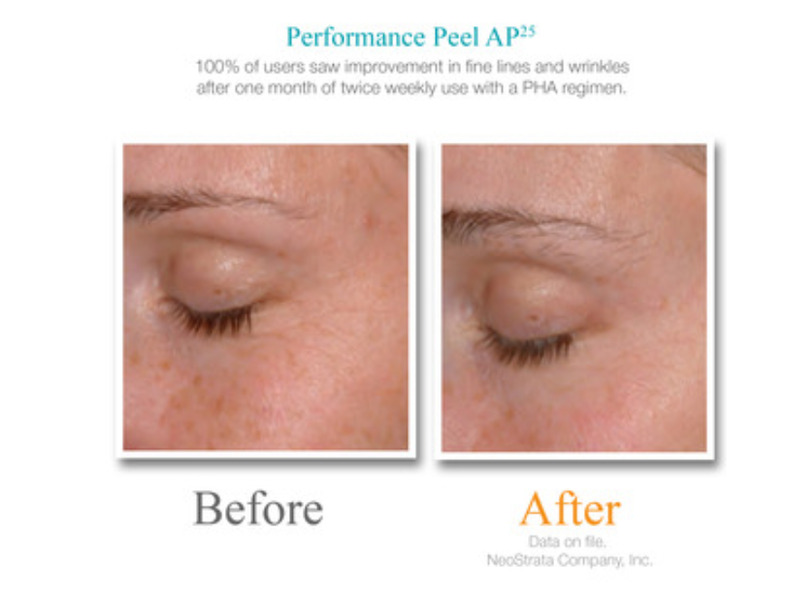 In order to use this peel your skin needs to be used to at least alpha-hydroxy acids. The Exuviance Performance Peel AP25 retails for $77.00 and is available from www.exuviance.com, www.dermstore.com, www.ulta.com and www.skinstore.com. Exuviance is one of the brands that is under the NeoStrata Skincare company. Like NeoStrata on Facebook: https://www.facebook.com/NeoStrataCompany; Follow NeoStrata on Twitter: @neostrataskin; Follow NeoStrata on Pinterest: https://www.pinterest.com/neostrata/; Follow Exuviance on Instagram: https://instagram.com/exuviance/; Follow NeoStrata on YouTube: https://www.youtube.com/channel/UCf_jdb_vpqIWkgUcNRHIWIA; Follow NeoStrata on Google+: https://plus.google.com/+NeostrataIncPrinceton.